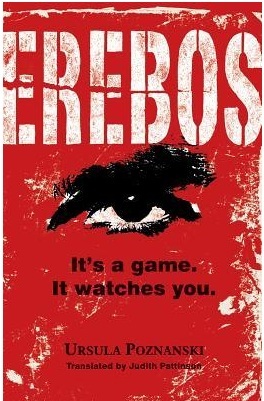 I was a bit wary of reading Erebos at first because I thought it sounded a lot like Ready Player One and while I really enjoyed that book, there’s only so many things you can do with a book about video games, right? It was the sound of a million video game players hissing at me all across the globe. I’m not even going to pretend that I know the gamer gabble (yeah, that’s not a real thing… I made that up) because I really don’t. I like watching when people play them but I think that is because I love film (I have been known to exclaim “WOW, that film looks really good! Can we go and see it?” And I get a stony glare in reply followed by: “That’s the new Call of Duty, Jo”), puzzles and watching people get so stressed over things on a television screen. But yeah, I can’t play games for toffee so I’m not going to go on about the gaming aspects of things because I think if I did I’d end up sounding like when my grandparents try to understand the internet. I decided pretty early on that Erebos and Ready Player One have two things in common. 1) They feature a game. 2) I really enjoyed them both. I thought the story and the world that Ms Poznanski created both within the game and out of the game was absolutely fascinating. When Nick, our pony-tailed hero, was playing Erebos it was like you were actually sat behind him looking over his shoulder and experiencing the world as he was. You could almost hear the gravel crunching under his character’s feet, the rustle of the trees and the scrit-scrat as poisonous scorpions came scuttling towards you. And you actually felt that there was peril involved. OK… maybe that was just me, but when Sarius’ life bar was dwindling…peril. Setting some of the story in the world of Erebos really added a whole new aspect to the book, something completely different to anything I’d read before. It felt like I was reading a fantasy novel, one of those proper ones with quests and swords and elves. And the scenes in the real world were just as exciting. While at first I did have my “Um, would that really happen?” and my “Err, why is there only one adult who is mildly concerned?” moments, I soon ignored them and just threw myself into the story. And then when the two parts merged? *shudders* Tense. I liked Nick, he was a good guy. He didn’t blow me away with his personality, however, but that really didn’t matter to me. This book wasn’t about individual characters and personalities (although I did adore Jamie) but more about how they all fit together for the whole picture. All together these characters made a great cast. I loved how they interacted together with little hints as to what was coming next, both in the real world and in Erebos. I do have a few minor quibbles with Erebos, however. And then of course the first thing you do is turn around and look? That’s kind of what happened in this book because I had been forewarned that the translation was a bit off. Now, I’m not blaming anyone because I’d probably have noticed it any way but I was definitely on the look-out for it. The translation was pretty dicey. This book was set in London and, without ruining everything, that’s an important aspect of this story. So when everyone was running around texting on their cells and having dramatic exchanges during their recesses and getting yelled at by their moms, it was incredibly jarring. I guess I just needed more repercussions. But enough of my whinging about little things, because I really, really enjoyed this book and I’m definitely looking forward to seeing what else Ms Poznanski will come up with next. Unnerving, exciting, mysterious and unique. If that sounds like something you’d enjoy; I wholly recommend trying to get your mitts on one of those blank disks that are circulating and being swapped in darkened alleys. It’s less perilous and people-getting-hurt-y. Just watch out for the messenger with the yellow eyes. He’s definitely up to no good. Nope, we didn't read this together! I admit though that her enthusiasm led me to pick this up a lot sooner than I probably would have. Great review, Jo! I am crap at video games as well, so I just don't bother with them and I do not understand their appeal AT ALL! But you do have me interested in this book and I didn't think this would be for me! @ Flann – Haha, I really loved RPO too! This one definitely isn't as lighthearted though, it's kind of more… “THIS COULD ACTUALLY HAPPEN TO YOU” than RP0. But it's still great. @ Catie – Thank you! I'm glad you enjoyed this one too. And yeah, I know. It was funny. This sounds pretty good. Ready Player One is the only gamer book I have read (I loved it!) but I am willing to give this one a try one day. I wasn't at all interested in this book till your review. It's an awesome review, by the way! « Connecting Girls, Inspiring Futures.